Ancient texts describe a time in the history of ancient Egypt known as the Predynastic era, where ‘Gods’ ruled for hundreds of years over Ancient Egypt, Akhenaten could easily have been an ancient Egyptian Pharaoh that belonged to that period, only out of place and time. Some‪ Ancient Astraunaut theorists interpret his elongated skull as a sign of extraterrestrial heritage. 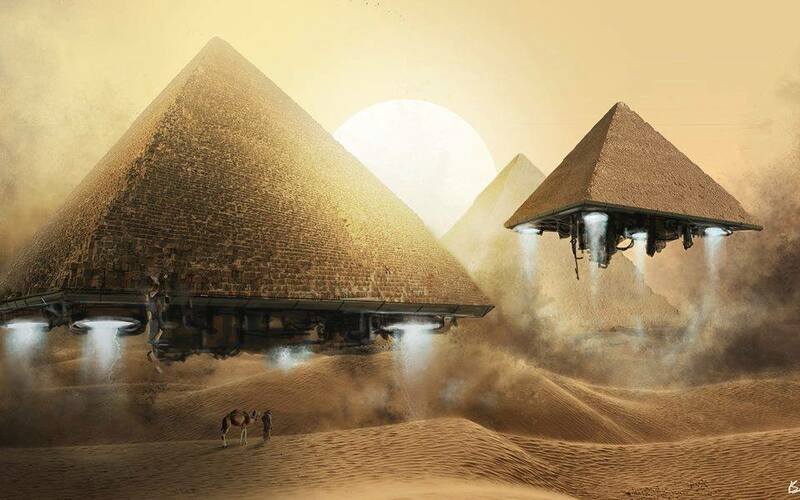 Ancient Egypt has one of the most incredible histories on the surface of the planet. Not only are the amazing architectural achievements of the ancient Egyptians noteworthy, but their incredible knowledge in different sciences is also an impressive detail shared by only a few other ancient civilizations around the globe. However, the Pyramids of the Giza Plateau and the great majestic Sphinx are not the on only mysteries surrounding the ancient Egyptian Civilization, their rulers belong to the list of the most enigmatic details of the ancient Egyptian Civilization, and one Ancient Egyptian Pharoah stands out from the rest: Akhenaten. Akhenaten, who was known before the fifth year of his reign as Amenhotep IV was a Pharaoh of the Eighteenth dynasty of Egypt who ruled for 17 years. He was the father of Tutankhamun, one of the most famous Ancient Egyptian Pharaohs. 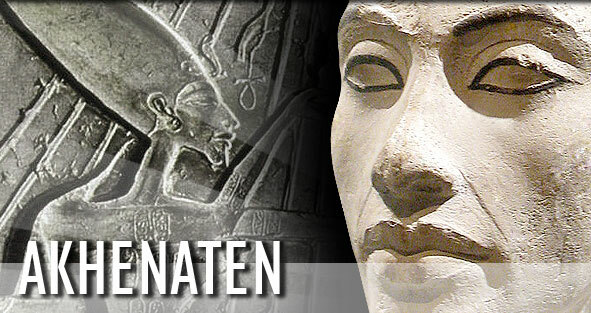 Many consider Akhenaten as one of the worlds’ greatest and most influential religious innovators. Many consider him as the first monotheist in all of history, a precursor to Abraham, Isaac, Jacob and Muhammad as prophets who worshiped one God. However, before Akhenaten, many strange Pharaohs ruled over Ancient Egypt. One of the most important ancient texts that can tell us more about this time in history is the Papyrus of Turin, which lists all the Pharaohs who ruled over Ancient Egypt. Not only does this list include all of the ‘official’ historic Pharaohs of Ancient Egypt, but it also includes the deities or “Gods” who came from above and reigned over the lands of Egypt before the first mortal Pharaoh of Egypt with a lineage that spreads over 13,000 years. It is a great enigma why mainstream scholars consider this ancient text as pure myth and why most details of the ancient text have been overlooked and omitted from the history books. The Palermo Stele is another ancient text which mentions the mystery rulers of pre-dynastic Egypt. Many researchers believe that the ancient Egyptian civilization originated in the year 36.900 BC, when ‘Gods,’ who came from the heavens ruled over the land of the Pharaohs. Akhenaten was believed to have bene one of them. Akhenaten, considered by many as a heretic Pharaoh, was the ruler responsible for taking ancient Egypt towards an entirely different religious lifestyle, trying to reconstruct religion departing from traditional ancient Egyptian polytheism. Akhenaten, upon becoming Pharaoh ordered all the iconography of previous gods to be removed. He only allowed one emblem, which was a sun symbol, literally a sun disk with curious arms or rays pointing down. The Aten, or commonly referred to as the ‘Sun Disk’ was illustrated in ancient texts, as a deity, and in The Story of Sinuhe from the 12th dynasty, a deceased king is described as rising as God to the heavens and uniting with the sun-disk, the divine body merging with its maker. However, Akhenaten was far more mysterious, and his strange looking body has fueled theories suggesting he may not have been an ordinary pharaoh but in fact a mysterious leader who arrived fro the heaven. While Akhenaten is well-known because of the mysterious shape of his head, the list of characteristics is lengthy: an elongated skull, long neck, sunken eyes, thick thighs, long fingers, backward-turned knee joints, a prominent belly that suggests pregnancy and female-like breasts. The first thing that is strange is his elongated skull, and in all of the statues and depictions of him, we see this elongated skull. In general, his body was sort of like a feminine and masculine mixture. This was, in fact, strange since all other Pharaohs were depicted as strong, imposing figures. 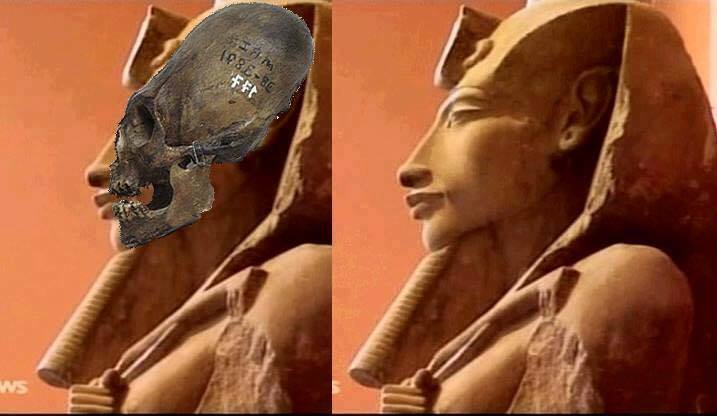 Akhenaten however, was not depicted like that, but as a weak, strange looking being with an extremely elongated head. Why would Akhenaten order the changes he did in the royal iconography to show him as this “weak” Pharaoh? Mysteriously, Akhenaten’s wife Nefertiti was also depicted having an elongated skull. Did they have some genetic anomaly that caused their heads– and body is in general to be misshaped and disproportional? Alternatively, is there something more to this strange Pharaoh and his origins? Is it possible that he was a hybrid human being? With genes and DNA from Extraterrestrials?